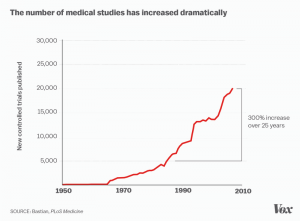 In case health information consumers already haven’t learned to turn a jaundiced eye on the flood of “news” about the latest, greatest medical research, the Vox news site has compiled some eye-opening charts and concrete examples to show what a fool’s errand it can be to look at a lone published study and think it describes a genuine therapeutic breakthrough. The site’s story starts by reminding that experts in 2003 looked at 101 studies published over four years in top journals that promised therapeutic advances. After a decade, just five of those big deals made it to market — and only one of the 101 was still in widespread use. 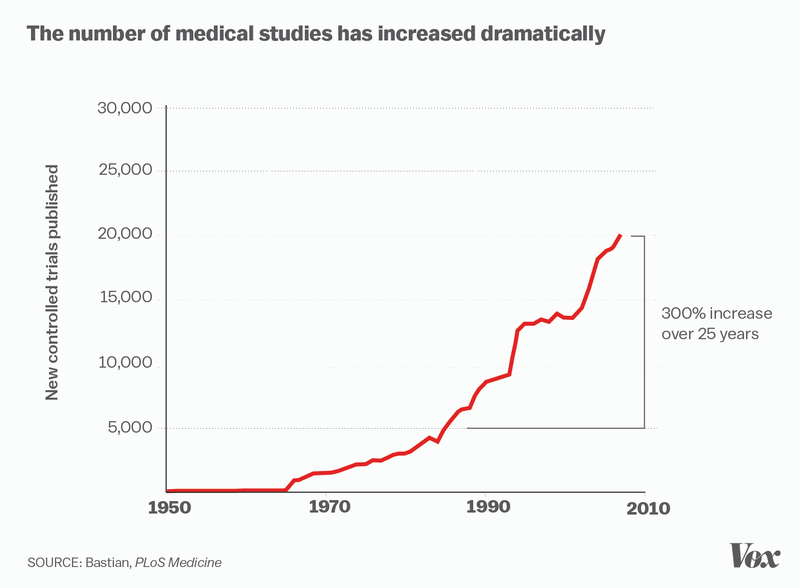 That efficacy gap hasn’t acted as any kind of deterrent to the torrent of research publication, as the Vox chart shows. The site, to be clear, isn’t aiming to debunk the value of peer-reviewed, published research that is shared widely in the medical-scientific community. I’ve written before about health information hype and how it hurts us, by raising false expectations, especially among the sick, and potentially leading astray patients, policy-makers, and politicians. There’s a bright line between being informed and being gullible. Skepticism is vital, while cynicism is not useful. I’ve also tried to highlight some enterprising, hype-busting sources. Healthnewsreview.org, a watchdog site about health information, is excellent. I’ve written about some experts online who poke at celebrity health blowhards, and I’ve found fun in how the gifted satirist Jon Oliver has skewered those who oversell health information. We’ll all keep our fingers crossed for genuine medical progress. But we won’t bite for junk reports.